Erstwhile LEGO gearhead guru Lino Martins is mixing it up, bringing us a big vignette of a haunting brackish backwater with a dark secret. 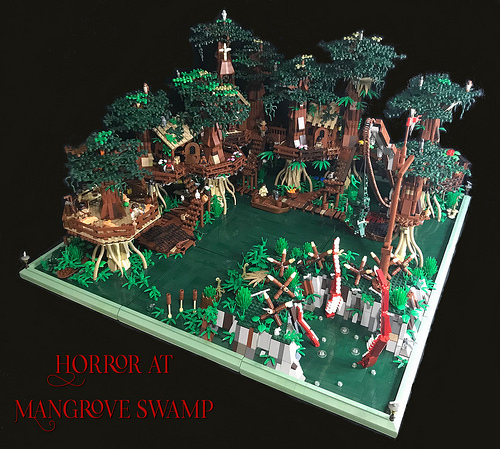 This collection of treehouses forms a small bayou village, whose residents are sworn to placate a fearsome beast with blood sacrifices, often in the form of giant alligators lowered into the creature’s tentacled arms by means of a rickety contraption. The smooth dark green bricks make excellent ponds of stale water, with a smooth finish of algae broken only by a few small ripples as the monster’s arms raise.